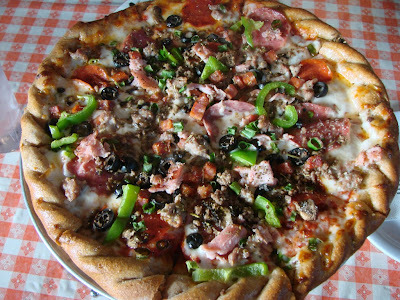 The Brick Oven “Super” Pizza which is combination of homemade sauce, cheese, salami, pepperoni, mushrooms, black olives, Italian sausage, lean beef, Portuguese sausage, smoked ham, green onions & bell peppers. Wow that is a lot of stuff on a pizza but it sure does taste good. We also tried a Margherita pizza which was good and capped it off with Creamy snickers pizza with cream cheese, chocolate chips, nuts and caramel which was actually pretty interesting and something worth trying just to be adventurous. Today we take a moment to stop and remember those who have fought and given their lives for our freedom. 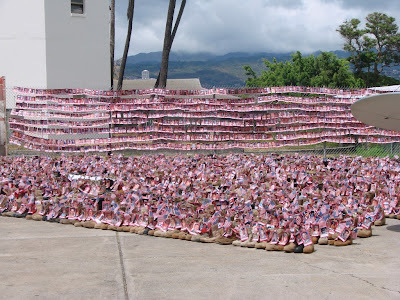 The 2012 Fisher House Hero & Remembrance Run, Walk or Roll was held on August 18 and gathered over 6,500 boots which lined the path of the run. 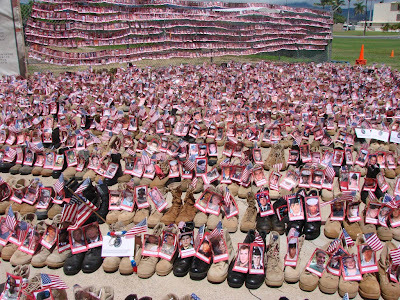 Each pair of boots represents a service member who has died since Sept 11, 2011 and includes their photo. After the run this display was set up at the Pacific Aviation Museum which was the end point of the run. The top photo allows you to see the sheer magnitude of the display while the bottom allows a closer look. All we can do is pause and look at the display and give our thanks to those who protect our country and their families. Thank You. It wasn’t all about remote control airplanes and jets here is a remote controlled helicopter taking off at the runway at the Pacific Aviation Museum. A little later in the day they would have helicopter “candy bombers” fly into the air and release candy for the kids to scramble for. 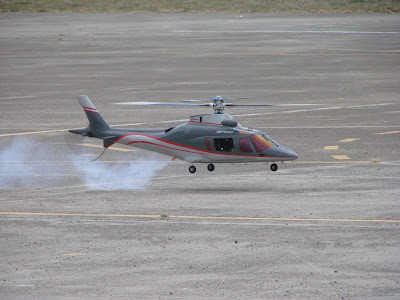 These gas powered helicopters are a world of difference from my whirlybird toy when was a kid. All it did was fly around in circles and go up and down though you could pick up stuff with a hook.